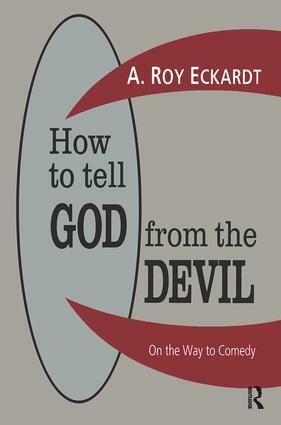 How to Tell God From the Devil is the first book to depict the relationship among comedy, the Devil, and God. Drawing from Jewish and Christian theories, Eckardt describes comedy as a means to distinguish the divine from the diabolic. He presents a thorough critique of efforts throughout history to justify God in the presence of radical evil and suffering. How to Tell God From the Devil is a sequel to Eckardt's fascinating earlier study Sitting in the Earth and Laughing. Eckardt offers a theological vision of the comic, and shows its practical use in differentiating God from the Devil. The viewpoint presupposed is a special application of the incongruity theory of humor, which sees humor as an attempt to deal with inexplicable occurrences. Eckardt shows how humor can make faulty explanations tolerable for examining evil and suffering, particularly the notion that God can somehow be "excused" for the terrible evils extant in the world. Eckardt critiques dualistic views that make the Devil and God independent sovereign beings, and monistic views that try to reduce evil to non-being. Eckardt holds God to be ultimately responsible for evil, in such ways that the only final resolution of evil-if there is such-is a form of divine comedy. Eckardt employs a variety of historical, psychological, sociological, philosophical, and theological sources. He discusses and assesses such diverse figures as Martin Luther, Reinhold Niebuhr, Zen Buddhists, Conrad Hyers, Nancy A. Walker, Jon D. Levenson, and Harvey Cox. How to Tell God From The Devil is an exceptional work, and will be significant and enjoyable for sociologists, theologians, philosophers, and specialists concerned with the study of humor. Chapter 3: Modified Monism: A Middle Way?